​Yes I do Commissions! :) The prices per item are comparable to other items in my shop. I reserve the right to re list any custom in my store to expand the product line. "trust me if you want it others will to" I do take request. But my list is long ....so very long. I have done hundreds of commissions and I know I can create something you will love. 1Q : Do you do commissions? 1A : Yes I do but it depends on subject matter and size email me with you idea and we can defiantly work something out. 2Q: How much will the commission be? 2A: It will depend on the size and complexity of the design. Normally I charge patch price if it is an Item I can resell in my shop. example: if you woudl like a species of butterfly I do not have in my shop I will create it for you at the price of a similar butterfly in my shop. I can do custom logos but price depends on the amount bought and complexity of design. I reserve the right to re-sell all my commissions unless it is a custom logo/design. 3Q: How do I get a commission spot / how long dose it take? 3A: Send me a note and when you are ready for the commission space I will send you the private listing it will hold you spot for 3 days. After payment we can start the commission process. 4Q: Can I see the end product/drawings before I pay? 4A: No I only start the commissions once they have been paid for. 5Q: How long dose it take what can I expect from my commission. 5A: Normally 1-2 weeks is my turn around time I stop taking commission once my spots are filled. If you are willing to wait for a later commission I can hold a space for you. 6Q: what is the commission process? 6A: The commissions process is a 4 step process. 1. After payment of the private listing. You can send me any/all your Ideas or images you would like it to look like. 3. Once the drawing is approved by you I will digitize the design. Then we can finalize color choices. 4. 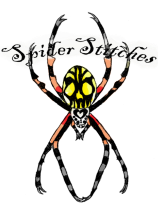 Once the Digitized file is approved I will sew out the patch and send you a picture of the final item and mail your patch to you. All sales are final on commissions .